Comfort and togetherness are keywords in the Peacock range. For the 2019 season, we will be turning up the soft options and seating experience when the range is launched in a soft rope material. We will also be seeing the addition of a sofa with the same elegant profile, a footstool and a sun lounger that you can almost move into. The Peacock lounge range has become a major success story for Cane-line and the designers behind it, Foersom & Hiort-Lorenzen MDD. The successful basic shape and the designer duo’s close collaboration with the craftsmen at Cane-line’s factory in Indonesia have provided inspiration for further designs and new materials for the range. 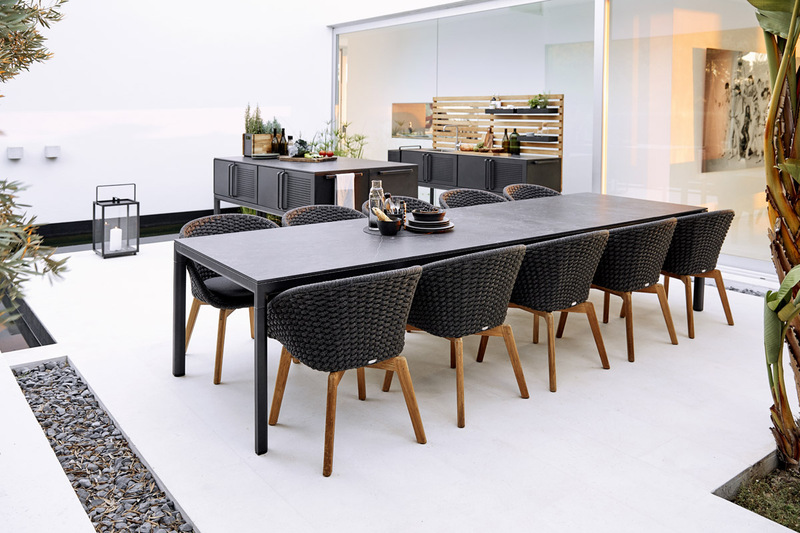 A teak frame still forms the base for the design, so the range matches the tables in the new Endless range – and brings a natural warmth to the outdoor area between concrete, plastic and steel. Teak is also the only wood that can withstand being outside all year round, and the teak Cane-line user comes from WWF-GFTN certified production, which supports responsible forest management. The seat, back and armrest on top of the teak frame are hand-woven on an aluminium frame to form the rounded peacock shape, requiring unusually skilled craftsmen. One dining chair alone takes up to a day to weave. From the 2019 season, the comfort will be further increased with greater use of the material: Cane-line Soft Rope – a polypropylene rope with a soft, comfortable surface which is also weather and UV-resistant and easy to clean. The weaving method has been developed in close cooperation with craftsmen in workshops in Indonesia, and scrupulous craftsmanship gives the range a very special look. 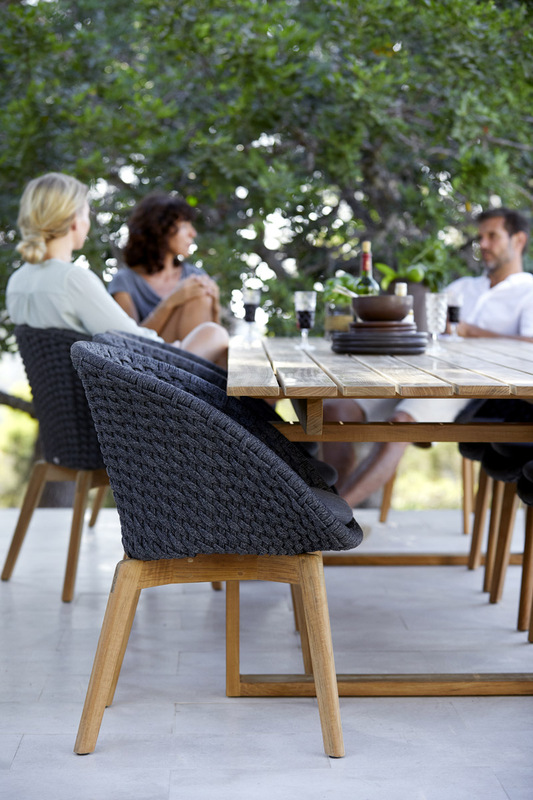 To make the seating experience extra comfortable, the entire Peacock range comes with seat cushions in Cane-line Natté, which has a fabulously soft surface. 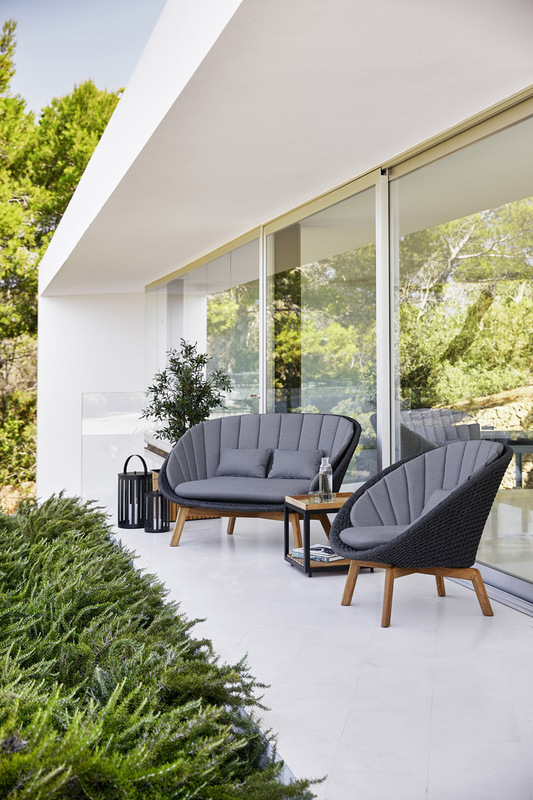 With the addition of an elegant 2-seater sofa and a footstool (which by virtue of its tempered glass top (accessory) can be transformed into a coffee table or a side table), it is now possible to build a complete outdoor lounge in the Peacock lounge range. The new, generously-sized 2-seater sofa is perfect for company and ideal for putting your feet up and enjoying a little me time in the shelter of its wide, shielding back. There is also a luxurious new sun lounger offering so much space that you almost want to move into it. A small teak table or a shading parasol can be mounted in the middle of the sun lounger. A real piece of luxury that will probably find its way into the best spot in the garden or into the pool areas of big hotels. Frame in Cane-line teak and weave in either Cane-line WeaveÒ or Cane-line Soft Rope with seat cushions in Cane-line Natté. All materials can withstand sun, wind and rain. Simply clean with soap and water. UV-resistant. Dimensions: Width: 151 cm. Depth: 95.5 cm. Height: 94 cm. Frame in Cane-line teak and weave in either Cane-line WeaveÒ or Cane-line Soft Rope with seat cushion in Cane-line Natté. All materials can withstand sun, wind and rain. Simply clean with soap and water. UV-resistant. Dimensions: Diameter: 60 cm. Height: 40 cm. 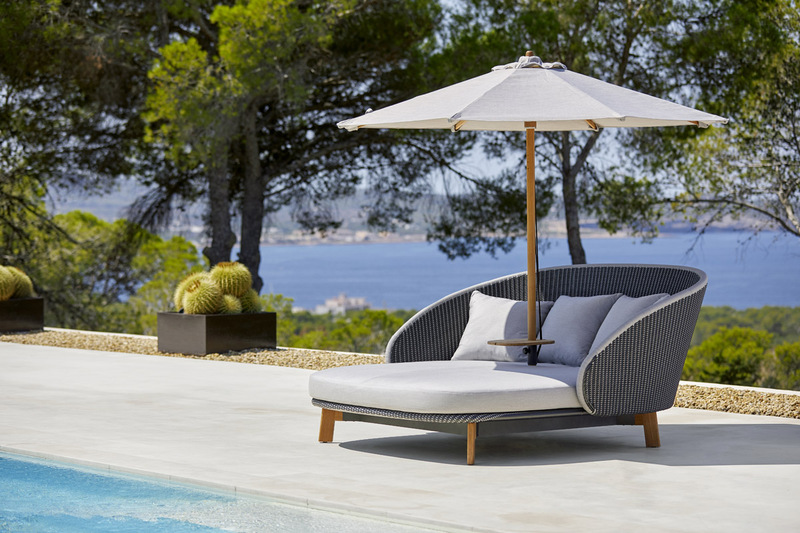 Frame in aluminium, legs in Cane-line teak and weave in Cane-line WeaveÒ with seat cushions in Cane-line Natté filled with the innovative QuickDryFoamÒ. All materials can withstand sun, wind and rain. Simply clean with soap and water. UV-resistant. Dimensions: Width: 219 cm. Depth: 199 cm. Height: 96.5 cm.